Bob Hine, technical consultant at BITA, is to retire in February 2017, ending an outstanding 10-year association with the trade body. The announcement brings down the curtain on a 46-year career in the materials handling industry for Hine – a qualified engineer by trade – which included a senior position with Linde where he managed the UK and overseas service product support team. In addition to his role with BITA, Bob also represented the British Standards Institute as a technical expert in standards-making activity across Europe and globally. James Clark, Secretary-General of BITA, comments: “What Bob doesn’t know about the materials handling industry – and forklift trucks in particular – is unlikely to be worth knowing. He is an expert in the purest sense of the term and his knowledge and skill have been of immeasurable benefit to BITA over the past decade or so. 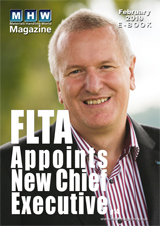 While we wish him the most relaxing and fruitful of retirements, he will be sorely missed not just by the team and members of BITA, but those across the industry who have come to rely on his expertise.